Now I would like to say that I enjoyed it – but to be honest I didn’t – that was just hard! But this was never really about the race as I always knew it was going to be hard, this is the hardest IM in the world and I think finishing it was one of the toughest for me ever. But this was about the journey, about coming back after 15 years to what is the ultimate triathlon in the world, to saver and cherish the experiences and memories. This truly has been an unforgettable time it has lived up to and surpassed everything I could of hoped for. As far as the race went! the swim was manic, I was on the start line and treading water for 25mins to try to make sure I could get a good start, which I did but it was still pretty scary with the shear volume of people. I got out in 1hr exactly, bit slower than I had hoped for but ok – then onto the bike which I found fairly straight forward and time passed relatively quickly. As I was towards the front of the age group field it was fairly well spread out and so riding at a constant pace was ok and no real packs formed. It was hot and very windy up and back to the turn at Hawi but in general the bike felt well in control and no real issues. But then the run!!!! I know about 1 mile that it was going to be tough as i just had no run legs, and then it is a very long way to go knowing this. Every mile ticked down painfully (and I mean painfully) slowly, I had to resort to walk through aid stations and just think of the finish which did eventually come. Really I had no idea what time I did and Did not see the clock I just needed the line – if I had been asked to guess my run time I would have said over 4 hr – so i was very surprised that it was still 3.40 (it felt so much slower). I knew my prep for this race had not been ideal and I was not as fit as for Lanzarote but I did what I could, I left nothing out there and I did some serious soul searching. 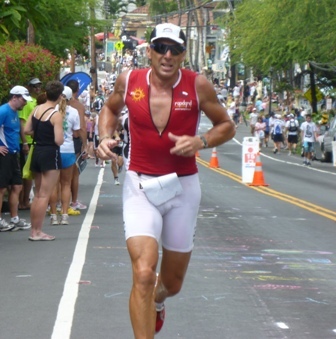 For all you out there (and I know there are many) who dream of doing Hawaii, do keep that dream, but when you come remember that this more than just a race – it is the experience of a lifetime one to saver and cherish. To all the people who have made this possible for me, for all the messages and kind words, for the support and belief, thank you so much. Non of this would have been possible without you. I will write one more blog today just to finish things off.